Applecrest focuses on the imperative connection between agriculture and community. 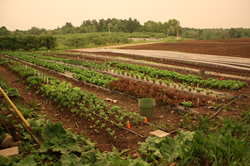 In addition to hosting an on-site farm market and farm-to-table restaurant, Applecrest participates in local farmers markets, offers a CSA, hosts on-farm events, provides educational school tours and is a strong supplier to local restaurants, grocery stores, schools and food pantries. As a sustainable grower of over two-hundred unique varieties of tree fruits, berries, vegetables, flowers and herbs, Applecrest is a pillar of the seacoast-area food shed. Our farm store is open daily year-round, winter hours 9am-5pm, summer hours 8am-6pm. Applecrest offers a wide array of locally raised and produced products including honey, maple syrup, preserves and pantry items, breads, pies and pastries, dry goods, prepared foods, a full dairy line, beef, chicken, pork and myriad other fine goods.